Jiri lies at an altitude of 1,905 meters and it is the traditional starting point of the world famous Everest Base Camp trek. The Jiri-Everest Base Camp trail is the ideal route of the legendary mountaineers – Sir Edmund Hillary and Tenzing Norgay Sherpa. 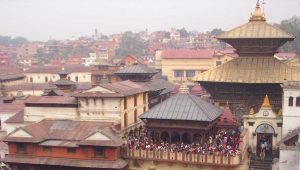 Regular bus service is available from Kathmandu everyday. 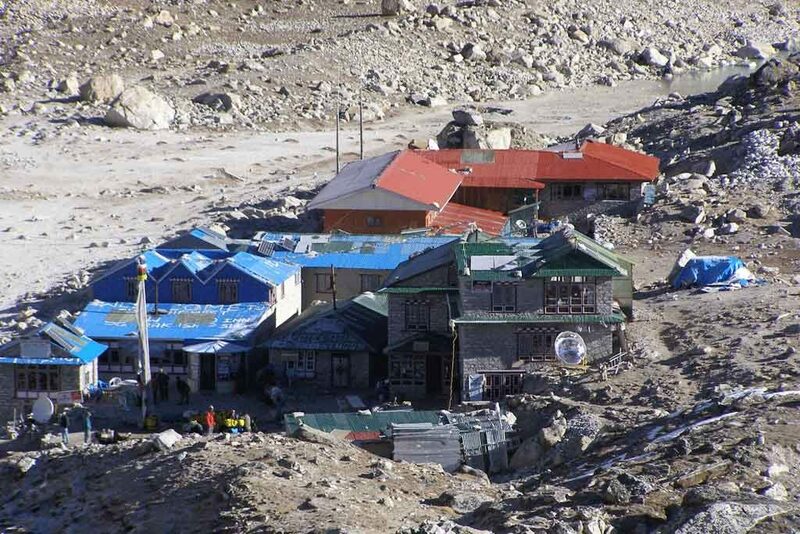 The Jiri to Base Camp of Mount Everest also refers to as the “classic route to Everest”. This famous trail lies in the Sagarmatha National Park which is a protected area in the Himalayas of eastern Nepal containing the southern half of Mount Everest. All early Everest expeditions used to start through Jiri. So, Jiri is also called as the “Gateway to Mt. Everest”. 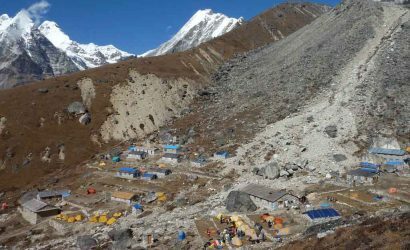 The Everest Base Camp trek starting at Jiri is equally popular and regularly used by trekkers for its great countryside and beautiful landscapes. Other reasons include the raging rivers, less busy trail and most importantly to have the opportunity of more gradual acclimatization. The trek from Jiri will join the other popular trek to the Everest Base Camp at Lukla or Phakding. Likewise, you will trek to Namche Bazaar, visit popular Khumjung Sherpa village and spend some time at the Tengboche Monastery. Finally, from Gorakshep, you will ascend to the Everest Base Camp and Kalapatthar. Kalapatthar offers the unbelievable Himalayan Panorama for lifetime. 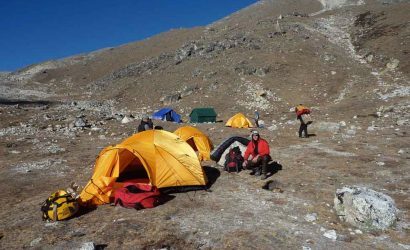 Trekking Encounters offers a customized itinerary as per our trekkers’ holiday schedule and committed to deliver quality services as per their expectations. We also offer an alternative itinerary to Everest Base Camp from Lukla for those who have short amount of time. Drive Kathmandu to Jiri (1,955m/6,414ft). It is a pleasant 7-8 hour drive by bus or jeep (188km/117 miles). Jiri is a reasonably attractive township with a number of tourist lodges and shops on either side of the road. We will be staying overnight in Jiri. Trek Jiri to Bhandar (2,190m/7,185ft). This is our first day of the trek. Snow peaks will now be visible on the horizon. We trek about 3-4 hours to arrive at Shivalaya (1,790m/5,873ft). Proceeding from Shivalaya, we cross the Chamla Khola (river) on a suspension bridge and having taken in the alpine views of mountains at the head of the Khimti Khola valley, we start to climb steeply on stone slap steps, emerge from the shade of trees and come to a simple group of teashops. We reach Deurali (2,705m/8,875ft) after climbing through the woodland and a forest of rhododendrons in about 3 hours from Shivalaya called Deurali. 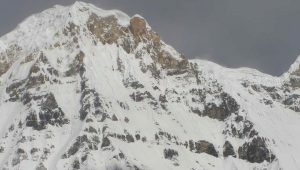 Deorali has a cluster of lodges on the ridge separating the valleys of the Khimti Khola and Likhu Khola and also a large mani wall (Tibetan Buddhist prayer wall). We pass several mani walls en-route from Deurali to Bhandar. Finally, we come to our overnight stop at Bhandar, a Sherpa village having several good lodges and teahouses ready to welcome trekkers. Trekking time 6-7 hours. Trek Bhandar to Sete (2,575m/8,448ft). We start our trek having crossed a stream through fields beside a long mani wall (prayer wall). The path now goes downhill through more fields and then descends steeply to cross a large stream on a wooden bridge. Then we climb the stone steps. After a few hours walk, we soon cross again a suspension bridge and enter the pleasant lodge settlement of Kinja (1,630m/5,348ft). This village is inhabited by Sherpa, Magar and Newars. On leaving here we start on a substantial climb of more than 3000ft to our next overnight stop, Sete (2,575m/8,448ft). Trekking time 4-5 hours. Trek Sete to Junbesi (2,680m/8,733ft). Today’s trek starts with a continuing climb through the rhododendron and pine forests. On leaving the last building we come to a trail junction, where we ignore the right-had path and wind our way up the ridge through thinning forest. We pass the mani walls again en-route. The trail continues to contour the hillside and for much of the way is paved with huge stone slabs. In about 3-4 hours from Sete, we reach Lamjura La (3,530m/11,581ft) pass, a wide grassy saddle with prayer flags, prayer walls (manis) and great rock heaps. We descend from this point and pass through some teahouses. After rounding a bluff, a distant wall of snow peaks comes into view and not far below can be seen that most delightful of all the Sherpa villages on the trek namely Junbesi, with its yellow-roofed gompa. 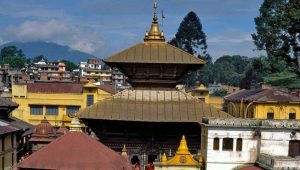 The village has a number of comfortable lodges, some grocer shops, a post office and a large school founded by Sir Edmund Hillary in 1964, the yellow-roofed gompa (monastery), a library, a telephone office and a health post. We stay overnight at Junbesi. Trekking time 6-7 hours. Trek Junbesi to Nunthala (2,330m/7,644ft). Today we trek through the village below a chorten (Buddhist monument) and cross the Junbesi Khola (river) on a wooden bridge and ascend through a forest of rhododendron, blue pine and oak trees. The view of a range of snow peaks to the north-east seen is outstanding if the sky is clear. The trail continues to climb through a large impressive gompa (monastery founded in 1946), a school and a cluster of buildings. The path now descends in a long sweep round the hillside and reaches our overnight stop Nunthala (Manidingma), with a broad paved main street, bordered by lodges and shops. It also has a post office and a health post. Trekking time 6-7 hours. Trek Nunthala to Bupsadanda (2,300m/7,546ft). Our trek today starts with a steep but enjoyable descent down a terraced hillside to the Dudh Kosi river through a glorious landscape. We pass through the Rai village and they are the major ethnic group of eastern Nepal. We leave the several bright and colourful lodges on the way. We then arrive to the clean, pleasant village of Kharikhola (2,040m/6,693ft). Kharikhola has several shops, teahouses, small tailoring shops, a school, a health post and a couple of camping grounds. We pass this interesting village and continue our trek to Bupsadanda, the next overnight stop which is perched at the head of a precarious slope and has a number of lodges, teahouses, a chorten and small gompa. Trekking time 6-7 hours. Trek Bupsadanda to Surke (2,290m/7,513ft). Our today's trek is out of the village into a forest area rising through a damp with streams and waterfalls and we might even encounter with monkeys here. We continue the trek to gain height. 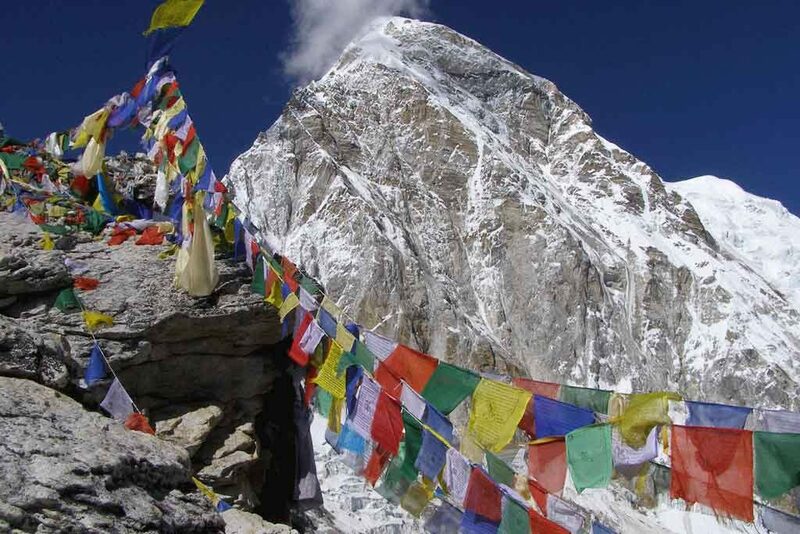 The hillside spur is marked by a mani wall and prayer flags. From certain points, we get sensational views down into the depths of the Dudh Kosi river gorge. We re-enter forest, cross a stream and come to the rapidly growing lodge settlement of Puiyan (2,795m/9,173ft). Beyond the village the trail has a more open aspect and continues to come to another high point on a spur with prayer flags. Lukla airstrip can be seen from here. The path now descends on rough steps to our overnight stop Surke which has a number of farmhouses and trekkers' lodges and is located in a basin below the trail. The Surkhe Khola (river) runs through this basin. Trekking time 3-4 hours. Trek Surke to Phakding (2,610m/8,568ft). Our trek today starts by crossing a stream and climbing to reach a mani wall where the trail forks and we take the left-hand option. There is another stream to cross beyond the mani wall and come to a splendid waterfall, pass more mani walls and arrive at the first part of the very pleasant village of Chaunrikharka (2,591m/8,501ft). It has several lodges, a small gompa, a Hillary school and a health post. The trail now passes through a rich agricultural area and rises to the neat settlement of Chheplung (2,660m/8,727ft), where it joins the trail from Lukla. Chheplung also has several lodges, some shops, a gompa and a health post. From this point on, the trail becomes much busier with trekkers from Lukla and yaks, etc. A short distance from the trail junction, the route drops suddenly to cross a suspension bridge over the Kusum Khola river in a narrow gorge. 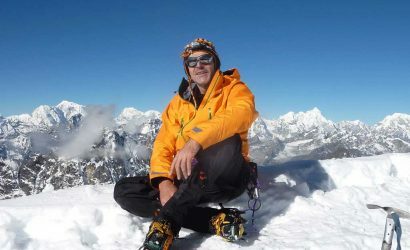 There is a splendid view of the very difficult trekking peak Kusum Kanguru (6,367m/20,889ft). Finally, we arrive at Phakding where we stop for overnight. Trekking time 3-4 hours. Today we stay in Namche Bazaar for acclimatisation. Because of the altitude, it will be necessary for us to spend a minimum of two nights here. On this day, we have the choice of just relaxing and roaming round this interesting hill town, or alternatively trekking round a nearby 3-4 hour circuit with stunning views. On this excursion trek, we pass through two traditional Sherpa villages Khumjung (3,780m/12,402ft) which has a chorten at its entrance and Khunde (3,841m/12,602ft) where there is a small hospital. This day helps a lot for acclimatisation for our further trek to Everest Base Camp. Trek Namche Bazaar to Tengboche (3,867m/12,687ft). On this day while climbing out of Namche Bazaar along the hillside to a point, we will have the stunning views of Everest, Nuptse, Lhotse and Ama Dablam. A large white chorten is built along the trail to commemorate the 50th anniversary of the first ascent of Mount Everest on 29 May 1953. After waking through the rhododendrons and some small settlements, the trail continues on a steep descent to cross the Dudh Koshi on a suspension bridge. From the bridge, there is approximately a 2 hour steady climb up to Tengboche. Just beyond the bridge, a series of water-driven prayer wheels and lodges alongside the trail are found. We then continue to climb mainly through forest and before reaching the ridge at Tengboche, the trail then past a chorten with Nepal’s largest gompa nearby. The up valley view from the top is unbelievable with Mt. Everest dominating the background (a great photo shoot). Tengboche or Thyangboche Monastery (3,867m/12,687ft), also known as Dawa Choling Gompa, is a Tibetan Buddhist monastery of the Sherpa community located in the Everest Base Camp trail of Nepal. It is the largest gompa in the Khumbu region which was built in 1916 by Lama Gulu with strong links to its mother monastery known as the Rongbuk Monastery in Tibet. We stay overnight in this beautiful Tengboche village. Trekking time 4-5 hours. Trek Tengboche to Dingboche (4,410m/14,469ft). The trail passes downhill from Tengboche through the pine and birch trees and tall rhododendrons. we then arrive at Deboche (3,710m/12,171ft) which has a trekkers’ health post. Over the bridge, the way climbs up valley, passes chortens and mani walls, then goes through a kani. Shortly after this the trail divides as it approaches the village of Pangboche (3,930m/12,894ft). We arrive at this point in about 1:30 hours from Tengboche. 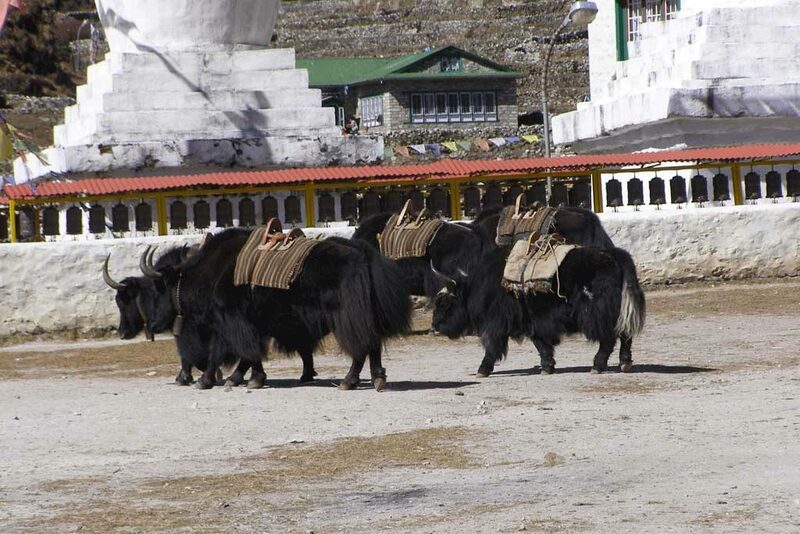 Next comes Orsho a high yak-grazing pastureland before Dingboche. The trail splits here at a small mani wall, the left-hand branch going to Pheriche while the other branch going towards Dingboche. We continue our trek uphill towards right to the traditional Sherpa village of Dingboche. Dingboche has a number of lodges, spread among its stone-walled fields. On the western hillside adjacent to the village, there are two large chortens. Dingboche is dominated by the world’s fourth highest mountain, Lhotse (8,501m/27,890ft). We stay for two nights at Dingboche for acclimatisation. Trekking time 5-6 hours. Rest and acclimatisation day in Dingboche. Today we stay another day in Dingboche for acclimatisation. To aid acclimatisation while relaxing in Dingboche, we can have a day trip to Chhukung valley and return to Dingboche for overnight rest. Chhukung offers a marvelous view of the surrounding Himalayas including the Lhotse’s massive south wall. Alternatively, it is a good idea to have a trek up the Nagarjun hill. Trekking time 3-4 hours. 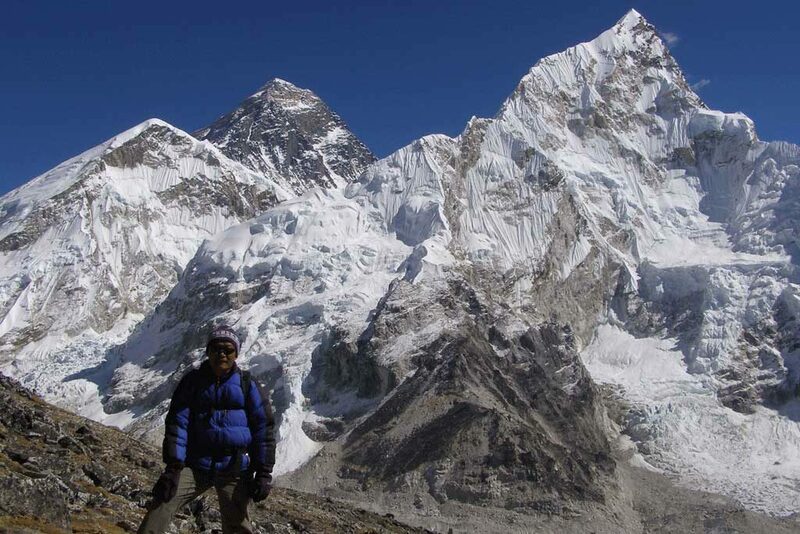 Trek Dingboche to Lobuche (4,910m/16,109ft). From Dingboche, we continue our trek passing through the yak-herders’ huts at Dusa (4,503m/14,774ft) and cross the Khumbu Khola on a wooden bridge and then climb to Dughla (4,620m/15,157ft) where there are a few lodges. From here the route heads up steep moraine (ridge of rocks) slopes, to a ridge with a number of large cairns, chortens, prayer flags and mani stones covered with Tibetan Buddhist prayer flags. The trail now enters the Khumbu valley, crosses to the western side from which one gets a clear view of the massive Nuptse (7,861m/25,791ft) and finally arrives at Lobuche. This is a busy place with trekkers camping in various spots on the far side of the stream and around the lodges. We stay overnight at Lobuche. It can be very cold overnight here. Trekking time 4-5 hours. 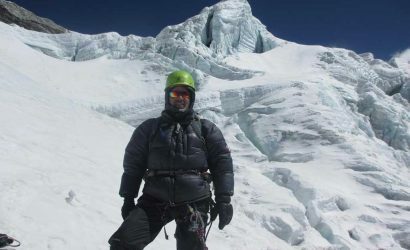 Trek/Climb Gorakshep to Kalapatthar (5,545m/18,192ft) and return trek to Pheriche (4,252m/13,950ft). Today’s trip is not only literally the “high point” of our entire trek but it also has the absolutely high point with unbelievable views from the summit of Kalapatthar. The long awaited trek starts around 5.00am. The climb takes about 1-2 hours (depending upon the route chosen) to reach the summit. On the arrival at the summit, one can experience the most fantastic sunrise over Mt. Everest. Kalapatthar is a spur of Pumori (7,165m/23,507ft) and in Hindi means “black rock” which is appropriate. It has two summits and two ascent routes, both paths being clearly visible from Gorakshep. 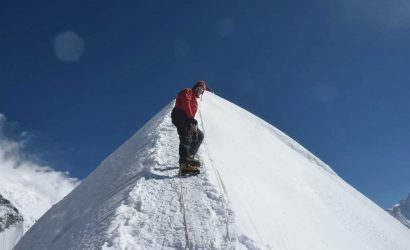 The left-hand path which wriggles its way to the secondary summit (5,545m/18,192ft) takes 1-1:30 hours and the other which zig-zags up the eastern flank to the higher summit (5,623m/18,448ft) takes 1:30-2 hours. Neither route is technically difficult. 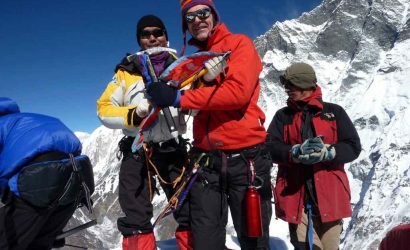 Another alternative is available which takes in both summits, climb the left-hand trail to gain the lower top, marked with a number of slender cairns and then continue along the ridge scrambling over rocks and reach the higher summit with its flutter of prayer flags. From both summits, a truly incredible panorama is spread before you. Although Everest is of course the main focus of attention, the ice cone of Nuptse which from this view point appears higher than Everest, has stunning beauty. Having really soaked up these incredible views we will return downhill to Gorakshep and then continue our trek down to Pheriche after breakfast. We stay overnight at Pheriche. Trekking time 7-8 hours. Trek Pheriche to Namche Bazaar. From Pheriche, we leave mountains behind us and the descent takes us through the Tengboche Monastery back to Namche Bazaar. The last section of the trail is of course the one we covered on our northbound trek, but now facing in the opposite direction will have a totally different prospect. We stay overnight at Namche Bazaar. Trekking time 5-6 hours. Return trek Namche Bazaar to Lukla (2,840m/9,318ft). Again we proceed southward, retracing the route trekked on day 9 and further to Lukla, crossing and re-crossing the Dudh Koshi at intervals. We stay overnight in Lukla. Trekking time 6-7 hours.